This is the debut album from a member of the Kate Rusby Band, with the divine lady herself guesting, with some backing vocals, as does Eddi Reader, Andy Seward and others. 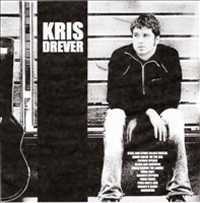 Originally from Orkney, Kris Drever came up through the Edinburgh folk scene in the 1990s, and as well as working with Kate Rusby was a member of the Fine Friday trio, Session A9, and has formed a new trio LAU with Aidan O'Rourke and Martin Green. Black Water features traditional airs arranged by Drever, producer John McCusker, and Seward, such as Patrick Spence, and Green Grow The Laurel, as well as some contemporary folk tunes. A first listen suggested a strong concern with social justice reminiscent of Ewan MacColl's Radio Balladdays; further listening allowed the album to open up a little, and brought an appreciation of the light and shade. Pleasant and expressive vocals, with understated but pertinent guitar work; allow the lyrics to occupy centre stage. It would be helpful if you're already a folk fan, but this CD has much to recommend it to all listeners, and is short-listed for the traditional music awards 'album of the year'.